This walk will take you along Difficult Run between the Dulles Highways and the W&OD Trail. (South) The walk starts on the asphalt trail at Days Farm Drive opposite Black Eyed Susan Lane. The trail goes between the homes, turns right and passes a tennis court on the left. (North) The trail ends at a vehicle barrier on Days Farm Drive opposite Black Eyed Susan Lane. (South) A natural surface trail intersects from the left. Turn left to follow that trail towards the Dulles Highways. You are now on the Cross County Trail. (North) The trail intersects with an asphalt trail behind homes. Turn right to follow this trail behind the homes on the left and past the tennis court on the right. You are no longer on the Cross County Trail. (South) The trail joins Difficult Run as both pass under the Dulles Highways. After emerging from the highways the trail turns to the left. (North) The trail joins Difficult Run as both pass under the Dulles Highways. After emerging from the highways the trail turns to the right and passes through a meadow. (South) A natural surface trail is barely visible intersecting from the left. The trail connects to Squaw Valley Drive. Continue straight on the present trail. (North) A natural surface trail is barely visible intersecting from the right. The trail connects to Squaw Valley Drive. Continue straight on the present trail. (South) The trail turns left to cross a bridge over a side a stream. After crossing the bridge take the trail to the right back towards Difficult Run. (North) The trail crosses a bridge over a side stream. After crossing the bridge take the trail towards the left back towards Difficult Run. (South) The trail crosses Difficult Run on columns. On the other side the trail widens and turns momentarily to the left. (North) The trail crosses Difficult Run on columns. On the other side the trail splits. Both trails rejoin within a short distance. The trail gets narrower from this point on. (South) Just before reaching houses on the right a Cross County Trail marker can be sent on the left next to an intersecting natural surface trail. Turn left to follow that trail into the woods. (North) The trail ends at an intersecting trail. Notice the Cross County Trail markers here. Turn right and follow the wide gravel trail towards Difficult Run. (South) The trail crosses a stream. The rocks provide an easy method to make the crossing. On the opposite side a trail intersects from the right. Turn left to continue on the Cross County Trail. (North) A trail intersects from the right. Notice a Cross County Trail marker on the right. Turn right to follow this trail across a stream using the rocks in the stream. This is an easy crossing. (South) The trail crosses a bridge. Trails intersects from the right on both sides of the bridge. Continue straight on the present trail. (North) A trail intersects from the left just prior to a bridge. Go straight to cross the bridge. A trail intersects from the left on the other side of the bridge. Continue to go straight on the present trail. (South) Logs have been placed in the mud here for bicycles. There is a mud-free path around this section. (North) Logs have been placed in the mud here for bicycles. There is a mud-free path around this section. Notice the landmarks here. Over the stream you will see what appears to be a ladder built across 2 logs. On the right is a tool shed up on the bank. (South) Just after point 11 a trail intersects from the right. Turn right to follow the trail up the hill. (North) The trail goes down a hill and intersects with a trail on the right. Continue straight along the stream and notice the landmarks at point 11. (South) The trail enters the cleared section of Tamarack Park. Stay to the right of the field and notice the Cross County Trail markers guiding you along the side of the field. (North) The trail follows the markers along the left edge of the field in Tamarack Park. The trail enters the woods to the left of the marker on the northeast corner of the cleared field. (South) The trail crosses a short bridge over a ditch. Turn left to follow the gravel trail on the other side of the bridge. (North) Turn right and cross the bridge over the ditch just prior to the edge of the park. Stay on the left side of the cleared field and follow the Cross County Trail markers along the edge of the field. (South) A trail intersects from the right. Continue straight on the present trail. (North) A trail intersects from the left. Continue straight on the present trail. 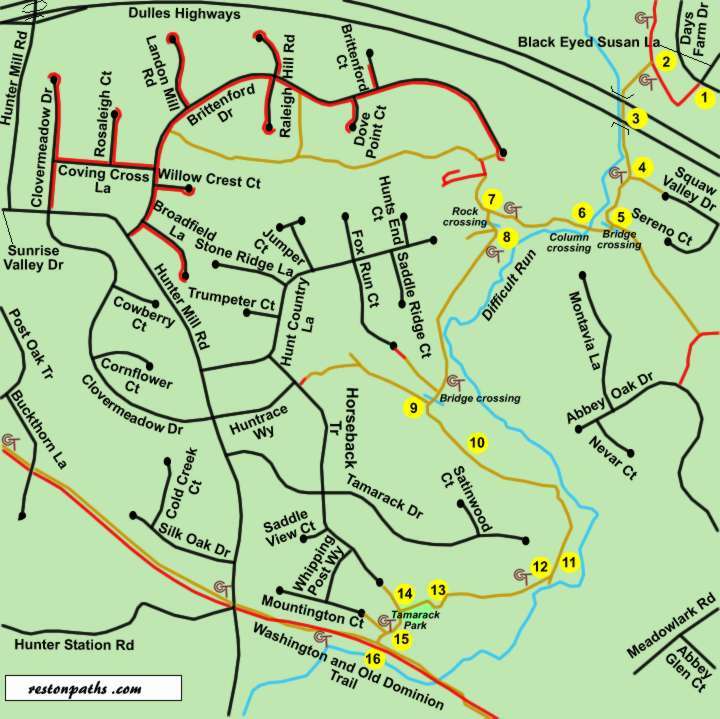 (South) This portion of the walk ends at the horse trail portion of the W&OD Trail. The Cross County trail continues as it follows the horse trail to the right. (North) The walk starts on the trail next to the Tamarack Park sign on the horse trail portion of the W&OD Trail. The trail enters Tamarack Park.